Veterans Day is a special day for us because we have lots of Veterans in our family, that span over several generations. It is because of the brave men and women who have served and continue to serve that we have our FREEDOM today! My Father - served in the Navy during the Cold War times but never saw any action he was dry docked or aboard a ship sailing in safe waters. My Brother - served in the Marines from 1995-1999. He was stationed on the West Coast and traveled to Australia and many parts of Asia. My Grandpa on my Moms side - served in the Army during the Korean Conflict. My Grandpa on my Dads side - served in the Army. Two Great Uncles - served in the Navy. Brother-In-Law (sisters husband) - served in the Army. Father-In-Law - served in Special Forces during the Vietnam War. Brother-In-Law (husbands brother) - served in the Army during Desert Storm and Desert Shield. Brother-In-Law (husbands brother) - served in the Navy. 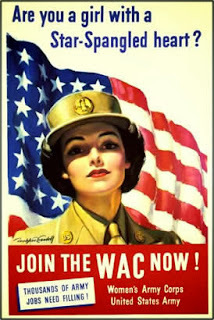 Great, Great Aunt - though she wasn't actually enlisted she did work for the Signal Corp of the U.S Army under the supervision of the Bell Telephone Company during WWI as an "Hello Girl". She was stationed at Fort Dix, NJ. In her autobiography she said," it was to be a government experiment as it would be the first time women were to be used in Army camps." Last week we had the pleasure of attending a local event that a Christian school, Perimeter School, puts on each year. They were so very kind to open their doors the public. First we recited the Pledge of Allegiance and sang the National Anthem. Then the children that attend the school sang songs, read essays honoring Veterans and presented very beautiful display boards that described what Veterans Day meant to them. There was also a procession and posting of The Colors. 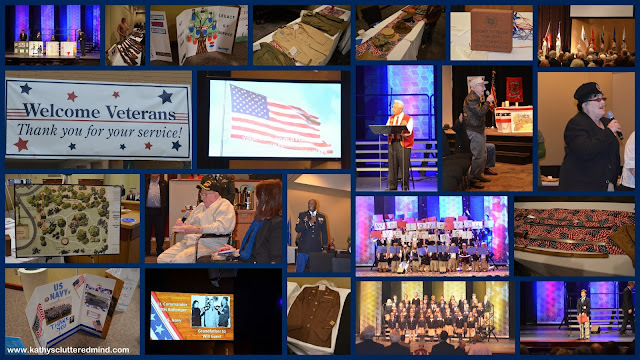 And there were two fabulous slideshows recognizing Veterans. We also had a couple moments of silence and prayer. Then we had the privileged of hearing a very special speaker, Mr. Hank Freedman a veteran of WWII and POW survivor. Mr. Freedman is a native of Boston but has lived in Atlanta since his mustering out of the Army in 1946. Read more of his amazing story here. Afterwards there was a reception where we grabbed a snack, looked at some really cool artifacts that the Veterans brought with them and we got to hear more amazing stories. There is a local group of Veterans here in Johns Creek, GA that is heading up a pretty awesome project called Veterans Memorial Walk. They are NOT using any tax payer dollars for the project. The Veterans Memorial Walk will be a meditative, handicap accessible, 4 acre site within Newton Park and will honor Veterans from each major conflict since WWII. It will be one of the countries largest privately owned and operated memorials. I also found out that they will be offing educations tours and military commemorations. All of this work is being done by Veterans who are volunteering their time to create an amazing memorial dedicated to Veterans, their families and supporters. The Veterans Memorial Walk is scheduled to open next year on November 1, 2014. Help make history by making a donation to this wonderful cause. It is estimated to cost about $200,000, and I believe they are about halfway there. No amount is too small. You can also become a sponsor or purchase memorial pavers. You can make a donation directly from their website. Also check out the Arlington: Field of Honor Documentary on YouTube. I made this journal page for my children. Though it does say Veterans Day at the top it is a page that can be used at anytime throughout the year! Download the journal page by clicking here or clicking on the photo below. -Visit Classical Composers for an awesome Veterans Day mini unit, which includes links to printable resources, videos, photos and more. -FREE Veterans Day activity pack. -FREE Veterans Day writing project pack. 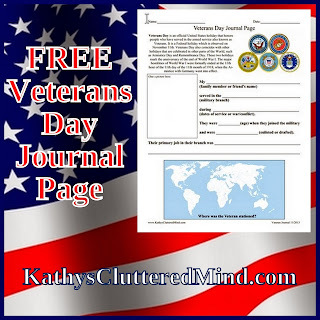 -FREE Veterans Day writing paper. -Founders Academy Honoring Our Veterans live online class.Only $7.00. We hope to see you there tomorrow! The corresponding Veterans Day lapbook is only $5.00. -FREE thank you hero printable. -FREE God Bless America Copywork. -Unit Studies by Amanda Bennett Veterans Day unit study currently only $4.00. -American Flag Chalk Pastel lesson. -Veterans Day mini unit study only $1.00. -View Over 2,000 never before seen war stories in digital video, plus hundreds of combat theater photos FREE at Witness to War. This is a fabulous website that will definitely bring tears to your eyes as you learn about some pretty amazing men and women. -Super cute Veterans Day craft idea. -Veterans Day activity booklet only 30 cents. -FREE Veterans Day math and writing activity pack - Here's To Our Heroes. 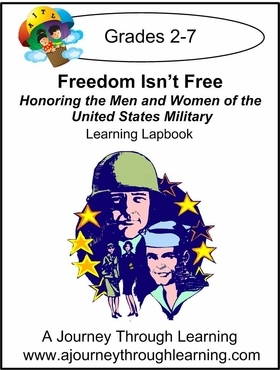 -A Journey Through Learning - Freedom Isn't Free unit study and lapbook only $4.50. I hope you enjoy these resources and consider making a donation to the Veterans Memorial Walk. So do you have any Veterans in your family? What a wonderful tribute to your family. I appreciate all the veterans who serve our country! Please tell your family Thank You from me....Freedom is not Free. From my family to yours, thank you. Freedom is costly, indeed. So many great patriots in your family. My father served in the army and my grandfather was in the navy during WWII. Wonderful tips for commemorating Veteran's Day. Thanks for the tips. My dad was in the Navy and my uncle in the army national guard. He was hurt in Iraq when they drove over a bomb. I appreciate all who have fought for our country. Thank you for all of the great resources for Veterans Day!! Many thanks to all your vets! Fantastic resources also! Thanks for a great resource and WOW.. your family is amazing..THANKS for the service.. Thanks for sharing these great resources. What an incredible family. This is a wonderful story,and some great freebies, and perks for our veterans, and servicemen & woman! Wow! So many in your family, that is so wonderful of them. This is a lovely tribute and great resource list too. Thank you! What great photos and thanks for all of the resources. My dad is a Vietnam vet, and he's only just starting to talk about it. Such a big sacrifice they all make...and I respect them so much! There are so many veterans in your family. It must be interesting to be among a group of people that believes in honor, sacrifice and service as your family does. My father was an Army man, he spend 21 years in the military and fought in Vietnam. I was always very proud of him. This is a great article and I love the resources you shared. 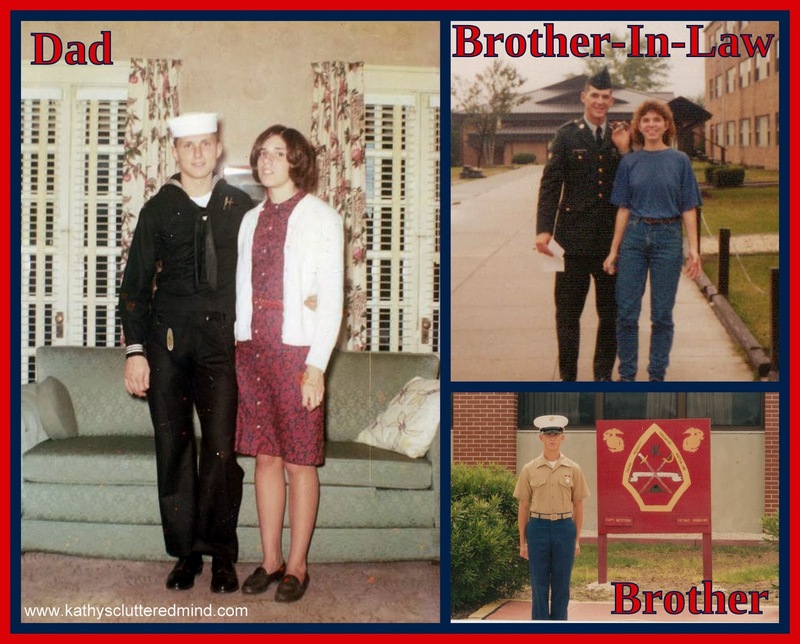 My husband is a veteran and brother and sister in law are currently serving. I hope you had a nice Veterans Day.